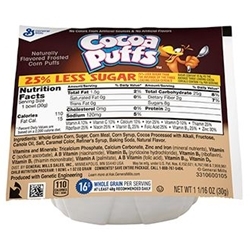 Cocoa Puffs 25% less sugar bowlpaks are a ready to eat dry cereal in a portable, easy-to-serve bowl. Great for use in K-12 schools, hospital patient dining and retirement/long term care facilities. Ingredients: Whole Grain Corn, Sugar, Corn Meal, Corn Syrup, Cocoa Processed with Alkali, Fructose, Canola Oil, Salt, Caramel Color, Refiner's Syrup, Baking Soda, Natural Flavor. Vitamins and Minerals: Tricalcium Phosphate, Calcium Carbonate, Zinc and Iron (mineral nutrients), Vitamin C (sodium ascorbate), A B Vitamin (niacinamide), Vitamin B6 (pyridoxine hydrochloride), Vitamin B2 (riboflavin), Vitamin B1 (thiamin mononitrate), Vitamin A (palmitate), A B Vitamin (folic acid), Vitamin B12, Vitamin D3.